Even if you aren't taking them seriously, social networks aren't the wastes of time they once were. We've invested far too much time, effort, and bits of our personalities into uploading photos, tweeting moments of our day-to-day, and exploring new media to label them "useless." What is useless, however, is throwing these nuggets of yourself into the Internet ether and losing them forever. And that's where Memolane, now out of invite-only beta, comes in. 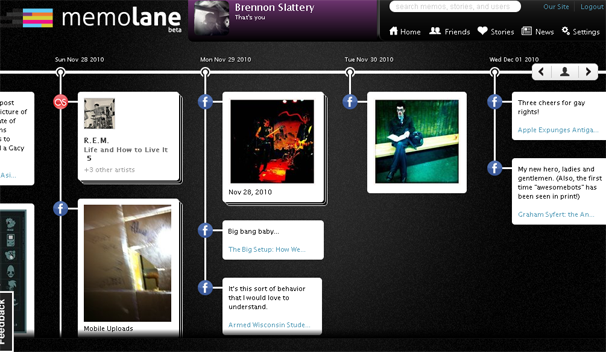 I explored Memolane in November and found it immersive and nostalgic with a great user interface. At the time, Memolane only aggregated content from a handful of sites, but now it captures data from Facebook, Twitter, Flickr, Picasa, Last.fm, Foursquare, Instagram, Tripit, YouTube, MySpace, Vimeo, and your RSS feeds. Your media memories are displayed as a horizontal timeline that you can navigate by dragging to the left or right or by clicking on the bar at the bottom of the page. If a piece of multimedia appears as a stack, clicking on it will show the photo series or the Last.fm tracks you blipped, and you can play songs back via Amazon MP3 samples or through your Spotify account. Privacy is your call. You can keep your data private, make it totally public, or share with a select group of friends you invite via e-mail. And if the friends you choose happened to attend the same event, you can collaborate and create shared timelines. Eric Lagier, cofounder and CEO of Memolane, told The New York Times that he views Memolane as a crucial component in the next phase of social search. "If you search for New York on Google or Bing, you will get a mess," he said. "But if you search for it on Memolane, it will show you your memories of New York." Memolane is still free to use, but a pay model for enhanced features seems inevitable. With all of this data stuck on far-flung servers, wouldn't it be nice if, for a fair price, Memolane could print out a glossy flipbook for your coffee table? As you can see from my screenshot, I don't use too many social networks right now. They always felt so disparate - too many log-ins, apps, "share" and "like" buttons. But with the integration of a fistful of new platforms, Memolane has given me a reason to use more social sites, because now, no matter how incongruent they are on their own, my little blips of life feel fleshed out - like real life itself.